#BOOKREVIEW: The Serpent Sea by #MarthaWells. When I was in my teens, I was obsessed with the work of Andre Norton. Her science fiction/fantasy books were muscular with action, full of strange, slightly trippy imagery and featured outcasts and misfits as their lead characters. 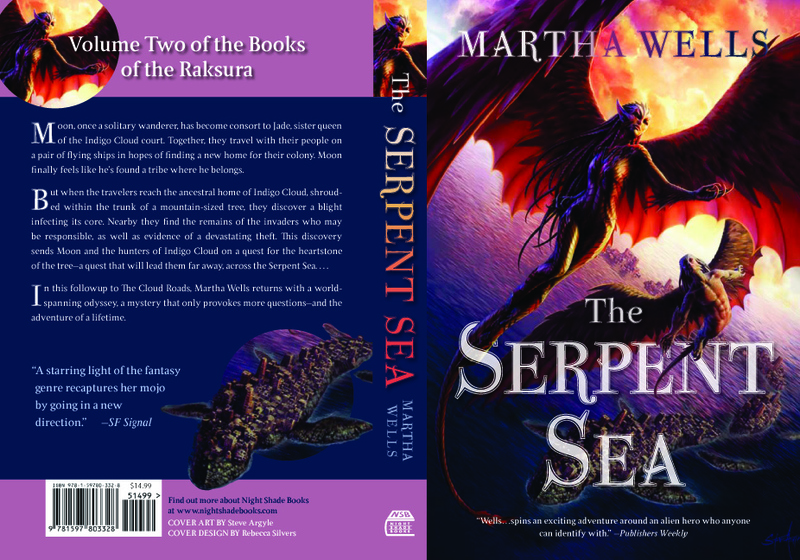 Martha Wells’ THE SERPENT SEA, the second in her Books of the Raksura series, is imbued with the spirit those Norton books. Wells’ Raksura novels take place in on an alien science-fantasy world called the Three Worlds. The Raksura are shape-shifters: one of their forms is as ‘groundlings’ and the other, as scaled, winged beings. They are rare in a world full of groundlings (earth dwellers) and waterlings (water dwellers). The main character is Moon, a foundling Raksura, and follows his initiation into the complex customs of the struggling Raksura court, Indigo Cloud. Picking up just after the end of THE CLOUD ROADS, Indigo Cloud moves into their long abandoned ancestral mountain-tree, and find that the tree is missing one vital component—the seed that magically guarantees the continued life of the tree. Moon and his friends start a quest to find the missing seed. The quest, full of adventure and derring-do, is also a chance to explore the flora and fauna of Wells’ imaginative land. Full of monsters and magic, the book is both a throwback to the Planetary Romances of Norton and nods to the New Weird creations of China Mieville. While Wells has an ear for crisp dialogue and her characters are nicely delineated, the world-building is the real star here. I look forward to the next and final installment of Raksura novels: THE SIREN DEPTHS. « Over the on the #gayya blog, I discuss my dual identities as #black and #gay.